You can read the brief article I wrote for The Rumpus about Charles Brownstein's appearance here. Thanks to Andrea Tsurumi, Paul Madonna, Isaac Fitzgerald, and (especially) Jess Worby for their editing genius, and to Connie Sun and Ben Katchor for making the New York Comics Symposium a great event every week. I had the good fortune to catch Charles Brownstein's presentation on his work with the Comic Book Legal Defense Fund. I had heard of the CBLDF a few years ago at SPX, as they often table at comics expos and events, but I didn't investigate further. Charles is passionate, serious, has a sharp sense of humor, while maintaining a deep appreciation for the absurd and offensive. We are lucky to have such a smart guy to defend the First Amendment in comics. What was most surprising about the 1973 obscenity trial in NYC regarding Zap #4, is that the booksellers, not content creators, were prosecuted and convicted of knowingly distributing obscene material. One of the convicted was a 23 year old Vietnam War veteran. 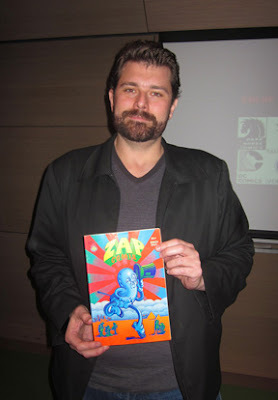 Ben Katchor hosts weekly panel talks about all things comics at the New York Comics Symposium. Sign up here for his weekly newsletter to see who's in town this week. Charles Brownstein holds Zap #4.